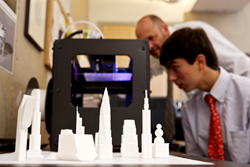 Students and faculty at The Hun School of Princeton are discovering the role of 3D printing in 21st century education. The day and boarding school is now home to two 3D printers in both the Science and Visual Arts Departments, yet the use of this tool is being employed throughout campus. Allan Arp and Nathaniel Bayona ’14 examine one of The Hun School’s 3D printers as it builds an architectural model, which Nathaniel created using computer-aided design software. The human anatomy and physiology class used 3D prints of bones in a class-made version of the popular game Operation. They were able to scale the bones to the size they needed, using computer-generated artwork. Students and faculty at The Hun School of Princeton are discovering the role of 3D printing in 21st century education. 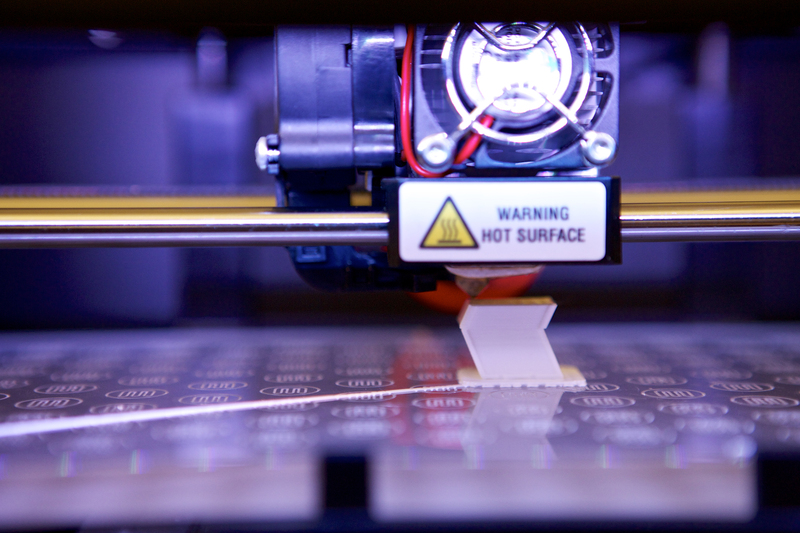 The day and boarding school is now home to two 3D printers in both the Science and Visual Arts Departments, yet the use of this tool is being employed throughout campus. A tool commonly used in design, engineering, and medical industries, is now employed regularly at The Hun School. Because of the customization, precision, and ability for unrestrained creativity, 3D printing has been used for mathematical discovery, scientific research, problem solving, and visual artistry. One way in which Mr. Lockhart-Gilroy has brought 3D printing into his physics classes is to model three-dimensional geometric shapes. “It is difficult to conceive three-dimensional representations of mathematic functions, particularly when your only way to display them is in a two-dimensional way. Now, we can give the printer an algorithm or formula and we can make it,” said Mr. Lockhart-Gilroy. Last year, the human anatomy and physiology class used 3D prints of bones in a class-made version of the popular game Operation. They were able to scale the bones to the size they needed, using computer-generated artwork. For students like Omar Abbasi ’14 and Suhina Srivastav ’15, 3D printing allowed them to test a theory that the shape of batteries affect a battery’s lifespan. They used the printer to create prints of various shapes and dimensions. Omar and Suhina then plated the 3D printed shapes with silver, and effectively made their own batteries. In the Visual Arts Department, Allan Arp teaches CAD – computer-aided design course. Through the use of CAD software, students create, modify, and customize design elements for three-dimensional models. Using creativity and visual language skills, students make representations of architectural renderings, sculptures, personal objects, and objects found in the physical world. CAD is used in various professional industries including architecture, animation, manufacturing, engineering, and visual arts. At The Hun School, CAD classes introduce students to design theory and the use of CAD software. The output of those designs are realized through 3D printing. “CAD is a tool with which students express their creativity and understanding of visual language. For our purposes in the Visual Arts Department, we focus on the creative side of design, but from a very practical sense, CAD can be used in conjunction with 3D printers for many practical purposes,” explained Mr. Arp. Much has been reported about the applications of 3D printing in various industries. Some exciting manufacturing concepts have emerged – particularly in industries such as automobile and aviation, biomedicine and bioengineering, and even the space industry. The European Space Agency, for example is testing the use of 3D printing on the moon, as they construct a lunar space station, using lunar dust. Scientists are testing the use of 3D printing technology as a streamlined and cost effective means to produce pharmaceutical drugs. In the realm of biomedicine, prosthetic limbs have been printed; and research is being conducted to create stem cell-produced organ prototypes using 3D printers. The Hun School’s 3D printers are tools for expression and exploration. Their use in the classrooms will continue to evolve over time, with the creativity of those who utilize them. The Hun School of Princeton is a co-educational, private day and boarding school in Princeton, New Jersey. On the 45-acre campus between Philadelphia and New York City, student-centered, hands-on learning prepare students for the global community in which they will live and work. The Hun School is comprised of 635 students in its Middle School, Upper School, and Postgraduate Program. The Hun School is home to students from twenty-three countries and eighteen states. The Hun School uses 3D printers in various departments throughout the School to assist in mathematic discovery, scientific research, problem solving, and visual artistry.The Hun School uses 3D printers in various departments throughout the School. Hun School Students Design a 3D FutureThe Hun School of Princeton’s faculty are discovering the role of 3D printing in 21st century education.